*Came home third to Buywise in a three-mile veterans' handicap chase over three miles at Sandown on January 6. *Successful over the Grand National fences when the comfortable four and a half-length winner of the 188Bet Grand Sefton Handicap Chase (2m 5f) in December, 2017. *Set to contest a third Randox Health Grand National - he fell at the first in 2015 but finished an excellent fifth in 2017. 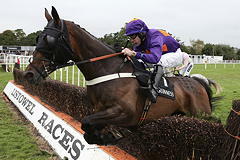 Also entered in the shorter Randox Health Topham Chase on Ladies Day, Friday, April 13. *Began his career with Philip Hobbs and had a spell with Jim Best before joining Ian Williams in the spring of 2016. The Three Graces syndicate is business associates and friends Peter Thwaites and Peter Le Gros, who met around nine years ago. Thwaites, who lives near Southport after being based in London, worked in the construction industry before retiring, while Wirral-based Le Gros was born in Liverpool (August, 1960) and has a steel fabrication business. The partnership is named after the Three Graces of the Liverpool skyline - the Royal Liver Building, the Cunard Building and the Port of Liverpool Building - which have long been seen as visual symbols of the city's commercial prowess. Thwaites' wife designed the colours of the partnership, while Le Gros' wife came up with the name. Le Gros has been interested in horseracing ever since his mother introduced him to the sport when he was younger and is no stranger to big-race success as an owner, having landed the 2008 Chester Cup with Bulwark which he co-owned with Dr Marwan Koukash. The pair met through work (Le Gros' company provided the steel for Koukash's Doubletree by Hilton Hotel in Liverpool city centre) and Le Gros' infectious love of horseracing rubbed off on the businessman, who became one of racing's most prominent owners. Son of the late Devon trainer Billy Williams, Ian was born on June 27, 1968. He initially studied accountancy at college prior to a brief stint working for bookmakers William Hill. He spent three years as an assistant to dual Grand National-winning trainer Jenny Pitman (1988-1991) prior to a six-month spell at multiple champion Martin Pipe's stable in late 1991. He moved on to Francois Doumen in January, 1992 and enjoyed four years at the French trainer's yard before returning to Britain and setting up on his own near Oxford in August, 1996. He has been based since 1998 at Dominion Racing Stables near Alvechurch in Worcestershire, south of Birmingham, which was set up by businessman Patrick Kelly who sold demolition firm DSM and development business St Francis Group, which Kelly and his family founded and ran, in 2017. Williams saddled his 1,000th winner on November 29, 2916 when Appy Days won at Lingfield Park. The dual purpose trainer has had winners at every British racecourse. He has had one Cheltenham Festival success, with Ballyalton in the 2016 Close Brothers Novices' Handicap Chase. Date of First Trainer's Licence: August, 1996. Randox Health Grand National Festival Wins: Sefton Novices' Hurdle (2010 Wayward Prince), Red Rum Handicap Chase (2007 Bambi De L'Orme) Other Big Jump Race Wins: Challow Novices' Hurdle (2004 Brewster), Hyde Novices' Hurdle (1999 Majestic, 2004 Brewster), Towton Novices' Chase (2010 Weird Al), Imperial Cup (2017 London Prize), Elite Hurdle (2017 London Prize), Grand Sefton Handicap Chase (2017 Gas Line Boy). Williams has also enjoyed plenty of success on the Flat including the G3 Meydan Sprint (2015 Sir Maximilian) and the Chester Cup (2008 Bulwark).